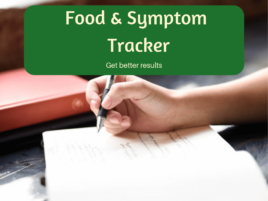 FODMAPs is not a game of perfect, and no matter how careful you are, even the most experienced FODMAPPERs will have days that they struggle with gut complaints. When that happens its great to have a tried and tested recipe that will help settle the monster in your tummy. There is almost nothing a bowl of hot chicken soup won’t cure. This one is packed with ginger and turmeric and perfect to settle your tummy on those days where it just won’t play the game. Heat oil in a large heavy based pan. Brown chicken and set aside. Add leek tips to pan and sauté until soft. Return chicken to pan, add FODMAPPED for You stock, water, ginger, turmeric and sugar. Cover and simmer gently for 1 hour, until chicken is falling apart. Add carrots, celery and drained and rinsed butter beans and allow to simmer for another 10 minutes until soft. Add soy sauce, mirin and coriander just before serving.